Princess has a birthday coming up next week. And Mimi had a birthday dress to make. 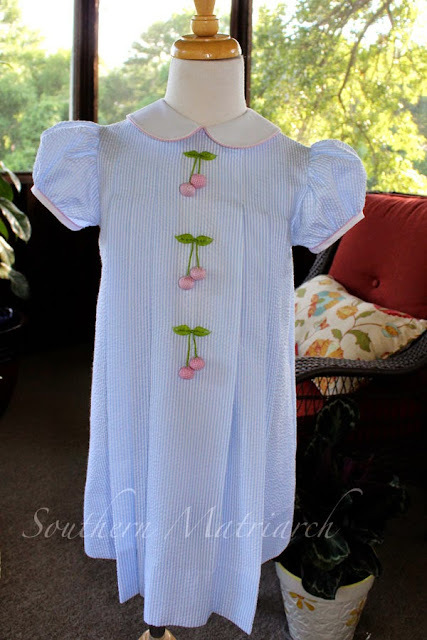 I have written about the "Cherry Dress" before here, here and here. It is much beloved where I live and an iconic symbol of the St. Louis Women's Exchange. This year's birthday dress came about in a convoluted way. For Easter I had given all the grands a sweet little board book. In there is a picture of some friendly animals having a picnic. Featured front and center of the picnic was a chocolate cake with cherries on top. Every time Momma mentioned her upcoming birthday, she immediately announced she was having a chocolate cake with cherries on top. It took some serious detective work on her mother's part to figure out where this idea came from. She would not be swayed that she was having said cake for her birthday. So when faced with an unrelenting soon to be four year old, Momma did what any mother would do, she decided a cherry birthday party was needed. So that is what was requested. I used a well loved classic pattern, Children's Corner Kathy Kelly. This was one of the first Children's Corner patterns I ever bought. I made kelly green dresses for my two oldest girls the Christmas they were 2 and 5. That two year old is Princess's mother. 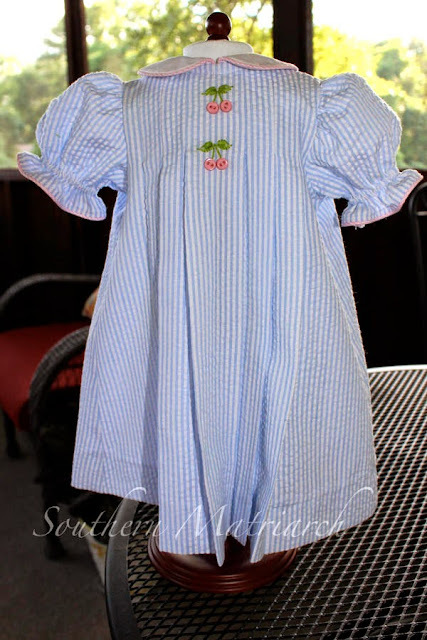 I substituted a peter pan collar for the lace or round collar to replicate the St. Louis dress. Ignore my "model's" uneven shoulders. I keep telling her to stand up straight. The dress is blue/white seersucker with poly/cotton pique for the collar and cuffs all piped with pink gingham piping. The cherries are three dimensional made from the gingham and stuffed with polyfill. The leaves are embroidered with two strands of floss. I love pink and blue together. I did interface the button bands and placket lap with a bit of german interfacing. Like me, if it has been 30 years since you put a placket into a box pleat, Lezette Thomason's video on Youtube is invaluable. 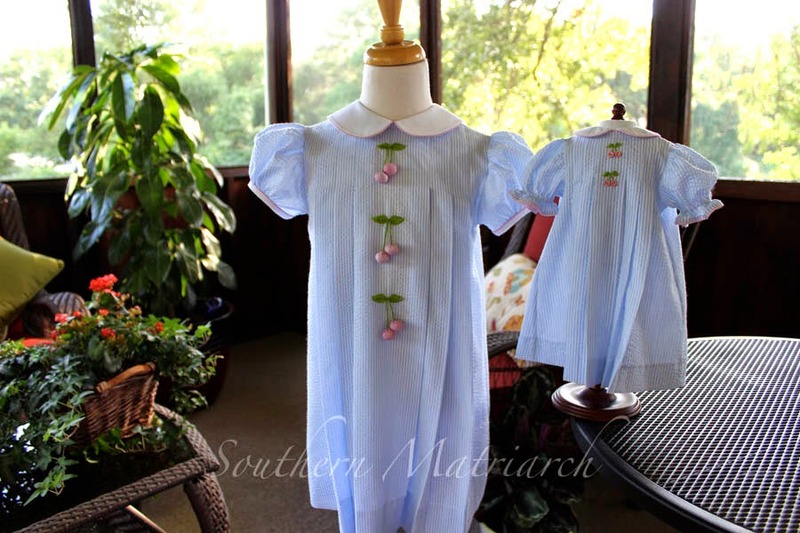 Two more doll dresses were made. One is for our local chapter's doll auction in November and the other is for an auction at the Miracle Bash to benefit Huntsville Hospital's Neonatal Intensive Care Unit. 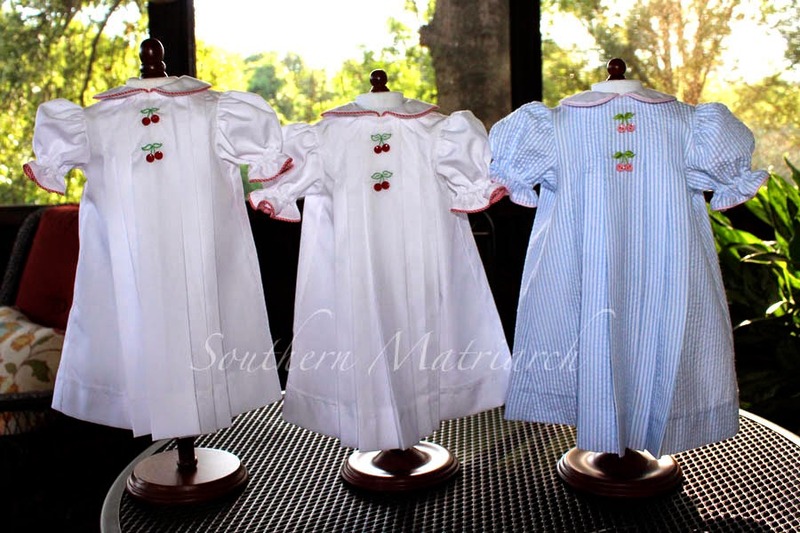 The two additional doll dresses were done in the traditional white with red trim. Since I was making cherry dresses I figured I would knock these out while I was on a roll. I sure hope Princess likes her birthday dress with dolly dress to match. I plan on enjoying a piece of that chocolate cake with cherries on top. I will let you know how it goes. What are you stitching on faithful reader? These are all very cute. I am sure that she will enjoy that matching dress for dolly. You did a great job. 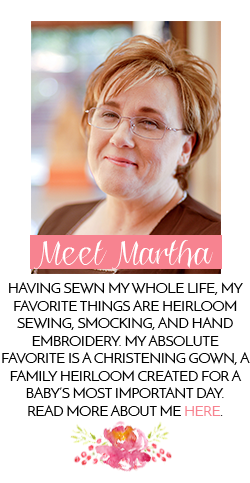 So sweet, Martha! Her fourth birthday sounds fabulous! Happy Birthday to the Princess. My very own princess who turned 6 in June, had a Super Hero party. I'll try to send you a photo. 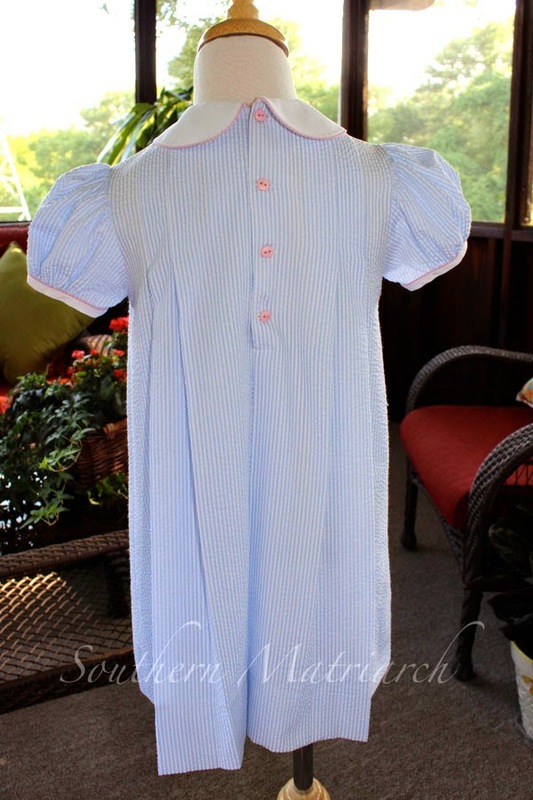 Anyway, I love this pattern and after making two for Easter, I think I have that placket down pat. Your dress is beautiful! I left the pleats "soft" on my dresses, but have also made it in a Liberty where I wanted crisp pleats. Have you ever tried stitching down the length of the inside pleat, very close to the edge and then placing fusible thread in the fold of the outside thread? Never iron pleats...gotta love it. This has to be done after the hem is in, so I usually do it part way down while constructing, so I can get to the top of the pleat, and then finish it after the hem is in. Not sure how permanent it would be on a heavier fabric. Martha, they are all adorable! Happy B-day to princess. I am always amazed at all you get done and at how well you do them. You are an inspiration! My five little monkeys are about to get too big for some "Marme" made clothes..enjoy while you can! 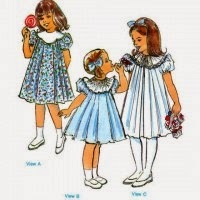 What sweet dresses! I am sure Princess will be thrilled. My stitching lately has been knitting - currently a pink anklet. What an inspiration you are! I think you deserve a Cherry On Top! 3 doll dresses WOW !!! You are my hero. 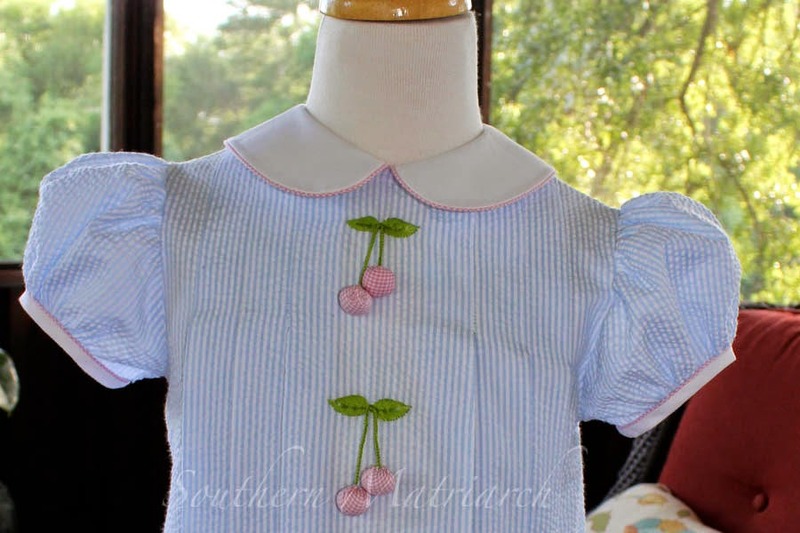 Love the blue with pink trim. Happy Birthday EM !! "Because I am a grandmother who has lost her mind---"
Best line ever! Aren't we grandmothers all a bit like that? Do you sell this? Any chance you would be open to it? It's adorable!